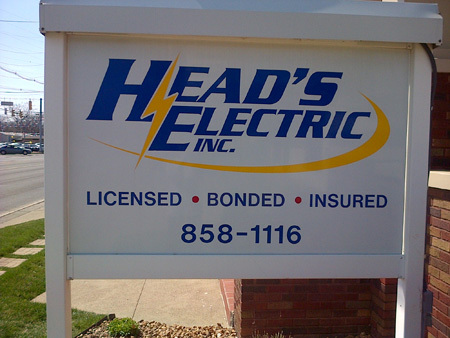 Here at Head's Electric we serve the greater Evansville area, as well as surrounding tri-state area. With over 25 years of experience, our Master Electrical Technicians are continuously trained in current codes & procedures. Our extensive training and certification allows us to guarantee our labor as well as our parts. We want your business and can provide you with a quality service that you will want to use again and again. Because we are not only electricians we are 'Home Safety Experts', it is our job to make sure your home is electrically safe. More fire damage is caused in homes by faulty wiring and negligence than any other source. In EVERY home we go to, it is our goal to address current problems, detect nearing problems, and prevent future damages. We believe that by the time we leave your home, you should know without a doubt that your homes electrical system is safe. Sometimes repairs need to be made right away, sometimes they can wait a while, and other times it may just be an option to think about. Our electricians are trained to look over your home and educate you about the safety of your homes electrical system. Sometimes a home may need a lot of electrical work, other times it may be in excellent condition. Our friendly electricians take it upon themselves to make sure that you know the condition of your homes electrical system. Unlike other companies that may try to push unneeded costly repairs on you, our electrician looks for the most economic solution, that still provides the highest level of safety, which gives our customers peace of mind! All this may sound like a lot of work, it is! But at Head’s Electric this is what we do, for your Home or Business.